I really miss Jollibee fast food since the day I choose to moved here. The Filipino taste is what I've always wanted to eat. I don't blame myself for craving it because I was used to the taste the day I was born. That's why I would like my son to have a taste of this famous fast food in Philippines. That every kid loves the mascot as well as the famous food. So when we went to NYC for my Philippine Consulate business. I never hesitate to ask my friends to take us there. In spite of the fact of how expensive it cost. I still bought and ate the food. I let my son ate at the same time with their "palabok", "chicken joy" and with the taste of "halo-halo". All of it, he likes it. So I have no problem of taking him there all the time once we visit my homeland. For a souvenir for me and my son. Below is the obvious picture of both of us that surely we'll both treasure. 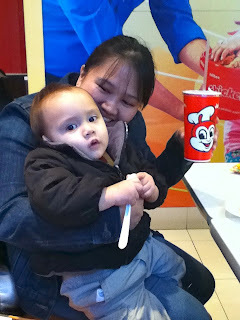 wow!how lucky is you baby...im always craving for the chicken joy of jollibee but too bad that we don't have it here..